Publisher: Dial Press, New York, New York, U.S.A.
"Caldwell and Thomason have created a stunning first novel; a perfect blend of suspense and a sensitive coming of age story. 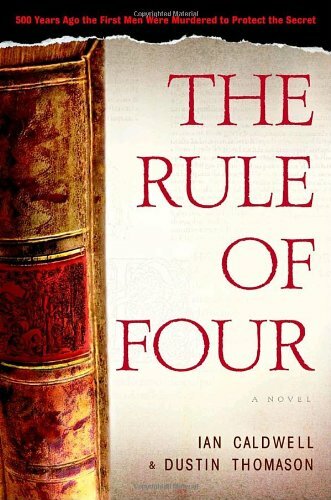 If Scott Fitzgerald, Umberto Eco, and Dan Brown teamed up to write a novel, the result would be THE RULE OF FOUR. An extraordinary and brilliant accomplishment - a must read." "As much a blazingly good yarn as it is an exceptional piece of scholarship ... a smart, swift, multitextured tale that both entertains and informs." "Profoundly erudite ... the ultimate puzzle book." "[An] intriguing intellectual suspense novel." "If you have a taste for puzzle-solving ... you'll be rewarded." "An impressive debut, a coming-of-age novel in the guise of a thriller, packed with history (real and invented) and intellectual excitement."